There have always been stories. All expressions, all communication, all history can just be summarized in that one short word. The cave paintings, stories in the ancient religious texts, the mythologies, the fables and jingles sung to children, the thrilling tales recounted by travellers gathered around a fire in cold dark nights, our films, literature, theatre, news, radio. The list is endless. Human beings are creatures of stories. These stories are what give us our identity, providing us with symbols to understand ourselves, to relate to others, and in the process giving us something tangible to hold on to as we untiringly attempt to make sense of the absurdity of existence. While on a road trip through the fabled ancient cities of Morocco earlier this year, I became acquainted with the Moroccan tradition of oral storytelling. As a photographer and filmmaker, visual narrative is my bread and butter. But the trip to Morocco triggered in me a desire to explore this disappearing art-form, which has deep roots not just in India, but all over the world, and which has played an incredible role in shaping the world that we live in today. But what separates the simple recalling of events from the magic that is created by a master storyteller, who can keep an audience of young and old on the edge of their seats for hours? THAT is the craft of storytelling. Studying that craft is the key to becoming a better storyteller, and that desire is what led me to Ms. Geeta Ramanujam’s wonderful storytelling center in Bangalore – Kathalaya. The one week I spent at Kathalaya, with a bunch of other similar storytelling wannabes, was an intense experience full of voice training, puppetry, psychology, crayons, the art and craft of creating and telling stories, and of course, stories and more stories! Some wonderful yarns emerged out of Geeta’s bottomless potli, and without planning for it, I had become a goggle-eyed kid listening with rapt attention to every word and sound. We all left the workshop with some skills, a bag of tricks, and with the happy illusion that we might someday tell stories ourselves. My good fortune was extended as Geeta very kindly invited me to assist her at a workshop she was to conduct at the National School of Drama (NSD) in Tripura. It was a no brainer for me. A chance to see the master storyteller at work from close quarters. We arrived in Agartala on a rainy late September morning. This was just about the beginning of the Navaratris and there was visible festive excitement in the city with large pandals being set up everywhere for Durga Puja. Most of Tripura is dominated by the Bengali culture and language, a fact that astonished me on arrival and revealed the limitations of my knowledge about my own country. Compared to the NSD campus located in Delhi, the one here was much smaller and conducted shorter, year-long courses. But situated in greenery, away from the hustle bustle and pollution of big theatre centers of Delhi and Mumbai, this location had a distinct charm. The students were an enthusiastic group. It was heartening to know, as we went through the introductions that the group comprised people from many different parts of India, including some from the smaller tribal communities around Tripura. This is not an expression of some nationalistic ‘unity in diversity’ fervour, but rather that the diverse backgrounds facilitate bringing together stories from incredibly varied cultures and languages across India. There is no greater pleasure as one dives deeper into the world of storytelling than to realize that the ocean of stories is endless, literally and metaphorically. There are more stories in the universe than can ever be counted or collected. So a novice storyteller, like myself, may never despair of running out of material! 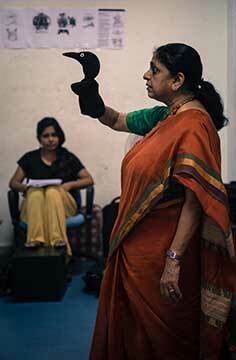 The first session included a basic initiation into storytelling with Geeta swiftly getting into her performer mode. It’s fascinating to watch a soft spoken, seemingly shy person suddenly transform into a passionate raconteur in the blink of an eye! And I had the best view because I could concentrate on observing her instead of trying desperately to convert every word into notes, as I had done at Kathalaya. Though my primary task was to assist and record the workshop, Geeta had suggested that I conduct one of the sessions. The thought of doing that excited me and sent shivers down my spine. It is all fine to attend a workshop and take notes. But to actually go out in the world and perform! Especially to follow Geeta, the seasoned performer, who has told stories all around the world, who can hold the attention of the most attention deficient people without even opening her mouth! I felt like a quack. Yet, I knew if I wanted to become a real storyteller, I needed to overcome my fear and take the plunge. It is my life’s mission to travel the world telling stories, collecting stories, connecting with and photographing people from different cultures, learning their languages, and working with children. It sounds like an idealist’s (or idler’s!) dream life, and I am no closer to finding out how to achieve it. But everything must have a beginning. Just like a story. Over the next few days we had several fun-filled sessions. Between telling some lovely stories, Geeta conducted exercises that explained how the body and gestures and voice modulation – in essence non-verbal communication – played a huge role in effective storytelling. She demonstrated how the use of simple songs not only added to the fun but also increased audience participation by creating mnemonic devices to help the listeners remember the story. As the last few sessions of our workshop approached, it was time that I bit the bullet. After much prodding and encouragement from Geeta, I decided to tell a tale from the Arabian Nights, or more accurately, ‘alif layla wa layla’ – ‘A Thousand and One Nights’. I have grown up in Delhi, the epicenter of the once great Urdu tradition. The Arabian Nights, rooted in the heart of the Islamic culture which spread across great parts of Europe, Africa, and Asia, was one of those endless collection of stories which were narrated by rote memory by dastan-gos, the travelling tellers of tales, around city squares, to spellbound crowds. These oral stories were collected over centuries from vastly different parts of the Islamic world, and put together into a comprehensive collection, not unlike how the great Hindu epics – Ramayana and Mahabharata were incorporated from centuries of oral narrations. Some of the most fascinating tales of my childhood – Sindabad, Alladin, Ali Baba, etc., come out of the many different versions of ‘The Arabian Nights’. It is a difficult set to perform, especially for a beginner storyteller like myself, because it is based on a frame narrative style, with multiple stories being told within a story as the narrative unfolds (like ‘Panchatantra’, for example). It’s a nerve-wracking task, not just to remember a long tale without losing the thread, but also be able to keep it just long enough to hold the interest of the audience from wavering. I narrated the very beginning of the Nights – the story of how the beautiful Scheherazade pacified the disgruntled emperor Shahryar by telling him wondrous tales full of strange and magical lands, of adventures in the sea, of kings and harems and genies and deserts, one after another for a thousand and one consecutive nights, in the process saving her own life, and those of scores of other women. Anxious as I was, the session went well. I might have stammered here and forgotten something there, but I had survived and had managed, by the skin of my teeth, to hold my audience’s attention (I know that because they did not check their phones!) Geeta was there throughout, as a teacher, as an audience, as a mentor and as a friend. It was a small thing, but I felt good about myself for having done it and not chickening out. And just like that, even as I was basking in the afterglow of my own little achievement, the week had come to an end. All the talking and training and discussions had led to the very last session of the workshop where the students got a chance to present their own set of stories that they had painstakingly prepared. They were all excited to tell them and I was thoroughly impressed with the confidence and passion of these young future storytellers. One of the most important skills in the storyteller’s bag of tricks is ‘belief’. Believing in the story, and one’s own ability to tell it. One can do without voice modulations, or expressions or any other “skill”. But to convince an audience to believe in the world that you are creating in those few minutes, you need to believe in it yourself. That’s the difference between great storytellers and merely good ones. It had been a very fruitful few days for me, and I bid adieu to NSD and Tripura, to head to the airport, and towards my own storytelling horizons with small, but confident steps. The author is a photographer and filmmaker based in Mumbai. His photography can be viewed at www.sidartphotography.com. He can be reached at sideysquare@yahoo.com.